This world feels like it's spinning faster every day. As the darkness has crept in, your brave prayers may have given way to fearful pleas that your kids would experience God's kingdom-in a safe and comfortable way. This generation needs heroes of the faith and your child can be one of them, but that will require you to be strong and BRAVE. You and I must call out the bold Christ followers within our children and help them face the unknown future with divine confidence. Courage starts with you, Mama. If you're going to raise a hero, you must become a hero-because brave kids need brave moms. Let's do this, together. 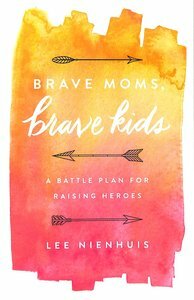 About "Brave Moms, Brave Kids: A Battle Plan For Raising Heroes"
Lee Nienhuis is a passionate Bible teacher whose love for the Lord and the Word is contagious. She is an area coordinator for Moms in Prayer International and a sought-after speaker who shares a dynamic vision for the next generation of Christ followers. Lee and her farmer-husband, Mike, have four kids and live on four acres of grass in West Michigan.